America Recycles Day, a Keep America Beautiful program, is a nationally recognized day dedicated to promoting and celebrating recycling in the United States. 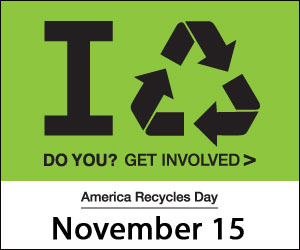 Every year on or around November 15, America Recycles Day event organizers educate neighbors, friends, and colleagues through thousands of events across the U.S. According to Mass Recycle, Massachusetts spends $400,000 to throw away 4,000 tons of trash each day. We spend $160 million of Massachusetts taxpayers’ money annually to manage trash. But soon there won’t be an “away”! By 2020, landfill capacity in Massachusetts will decline even more, forcing us to export two million tons of trash each year. A plastic bottle can be recycled into new containers, t-shirts and fleeces, park benches, plastic lumber, and playground equipment. Plastic bags are recycled into fences, decks, and shopping carts. (While not collected at the curb, many retailers across the country collect dry-cleaning, bread, and newspaper bags along with grocery bags). Aluminum cans go from the recycling bin to the store shelf as a new can in as few as 60 days. Recycled glass may be used in kitchen tiles, counter tops, and wall insulation. The 60% of paper that is recycled in the U.S. is made into products like cereal boxes, tissues, and file folders. Recycling is a multi-billion dollar industry that employs millions of Americans and helps advance our clean energy economy.